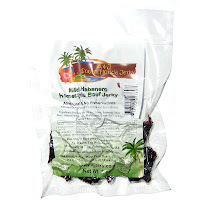 Next in the series on A&J South Florida Jerky is this Mild Habanero variety. See my previous review of their Original variety. A&J South Florida Jerky is a brand of A&J South Florida Jerky, Inc. based out of West Palm Beach, FL. The brand has been around since 2006. 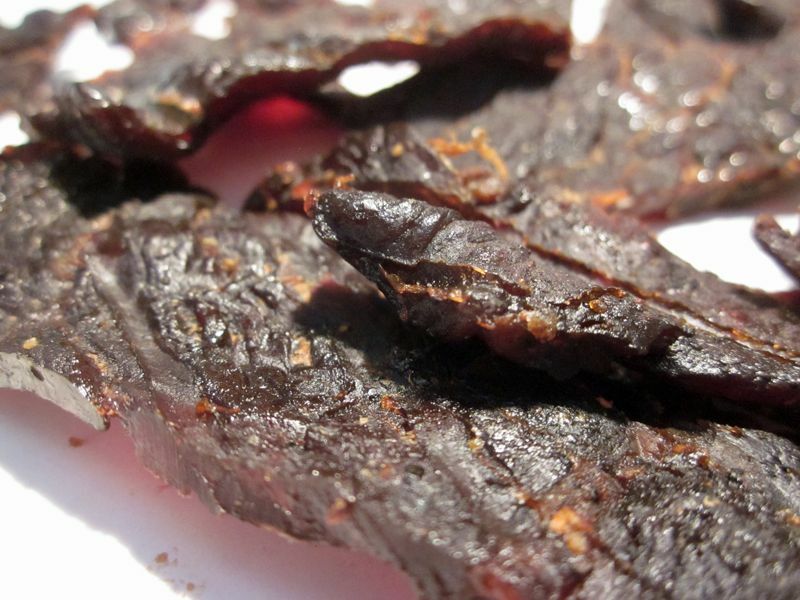 It's run by Andy Cohron and Jim Torhorst, a couple of buddies who had been making jerky for themselves and friends over the past 15 years, but decided to turn it into a business. In 2007 they became USDA approved and then incorporated. The company sources their beef from Australia, made from top round. 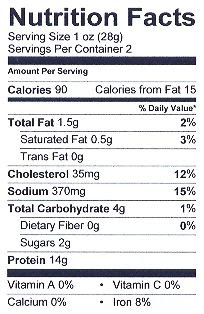 They claim it to be all natural, with no MSG, no nitrites, and no preservatives using a preservative-free soy sauce. The first thing I taste from the surface of these pieces is a light sweet mixed with a light saltiness. A faint bit of habanero chile flavor is noticeable. With more sucking, the soy sauce becomes noticeable. The chewing flavor starts with a more defined soy sauce flavor, while the habanero flavor picks up. A light bit of heat starts building up. The saltiness is a little more pronounced, and a faint ginger flavor is noticeable. Also a light bit of natural meat flavor. The label "Mild Habanero" might seem like two contradictory words, but in fact this has a light habanero chile flavor with only a faint bit of habanero heat. On my personal hot scale, this does seem rather mild. I can still feel a touch of that capsaicin, the chemical that makes chile peppers hot, in the back of my mouth, but with nary any heat on the tongue. Perhaps folks with lesser tolerance for chile peppers might see this a bit more intense, at mild-medium. 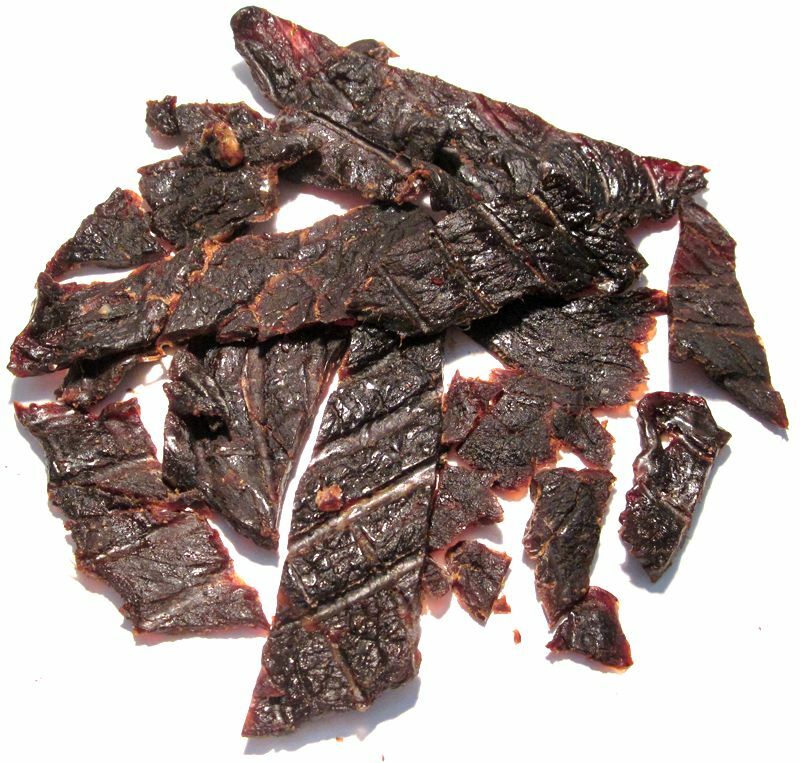 Like with the company's Original variety, the dominant flavor of this jerky still seems to be a mild soy sauce flavor, however the habanero flavor does a fair job of competing for that designation. But unlike with the Original variety, which had an easily noticeable ginger flavor, the ginger is more difficult to pick up in this. Perhaps the habanero chile masks some of that over, or perhaps A&J South Florida Jerky simply uses a little less in this, I don't know. The level of saltiness in this seems to feel at a medium intensity, not too high, and not too low. Also similar to the company's Original variety are the natural meat flavors, being lightly noticeable as I start the chewing, but becoming more identifiable in the latter part of chewing as the other flavors wear off. With the more subtle ginger component, it doesn't quite have that asian stir-fry beef flavor, but more of a soy-saucy grilled steak flavor, well-done. Overall, what you're going to notice in this is a mild soy sauce flavor with a light habanero chile flavor and a faint bit of habanero heat. There's a lighter ginger flavor, a moderate saltiness, with the natural meat flavors becoming more noticeable towards the end of chewing. A&J South Florida Jerky sells this Mild Habanero beef jerky from their website at a price of $4.50 for a 4oz package. If you bought four packages (sent to Southern California), they tack on sales tax of $1.17 plus $5.00 shipping, for a total of $24.17. That works out to $1.51 per ounce. As a Mild Habanero beef jerky, at the same $1.51 price per ounce, it's also a good value. I am in fact getting mild dose of habanero chile flavor and heat wrapped up in a beef jerky with an overall good flavor. I haven't come across other jerky brands that advertise a "mild habanero" variety, but I certainly have tried other habanero jerky brands that just didn't offer much flavor, but yet this is still priced lower. This Mild Habanero variety from A&J South Florida Jerky seems to deliver on its advertised flavor by providing a mild but still noticeable habanero chile flavor, with just a faint bit of habanero heat. Folks with sensitive tongues who are curious about habanero flavored jerky might do well to try this out. It's also quite comparable to the company's Original variety, having a mild soy sauce flavor as its primary taste with a medium level saltiness. The ginger is also in there, but not quite as noticeable as the Original variety, perhaps because its competing against the habanero chiles. You also get that natural meat flavor that comes through towards the end of chewing. But you also get the same crumbly chewing texture, which for me tends to subtract a considerable amount from the meaty chewing pleasure that makes jerky the great meat snack that it is. But there are other pieces in this review sample that still offer a decent amount of steak-like chewing. Overall, while the addition of "mild habanero" gives this jerky a more complex flavor than the company's Original variety, it's still not quite enough to give me that "wow factor". Like the Original, it's still a good jerky.